Born in Barry at the end of the Seventies Stormqueen were one of the many bands that proudly flew the Welsh flag for the NWOBHM but ultimately paid the price of being too far from London to grab the attention of the people who could make a difference to their future. As a result, theirs was a short-lived but exciting career and ‘Raising The Roof’ rounds up all their recordings, laid down at four sessions over the period December 1981 to October 1983. And not only does the album chart the band’s history, but in doing so it pretty much mirrors the development of the NWOBHM through the band’s musical evolution. Having worked hard at building up a body of original work the young hopefuls (vocalist Chris Glynn-Jones, guitarists Dave Morse and Neil Baker, bassist Bryn Merrick and drummer Neil ‘Boofy’ Clemo) went into the studio for the first time at the end of 1981. The four tracks recorded that day – ‘Battle Of Britain’, ‘Captives Of The Moon’, Lady Night’ and ‘Raising The Roof’ – crackle with youthful vitality and any rough edges resulting from an intense eight-hour session are easily outweighed by the excitement and enthusiasm conveyed through the songs. In particular, ‘Battle Of Britain’ gallops along at a fair old pace and you’d have to be heartless not to be enthralled by the hacking, staccato riff of ‘Captives Of the Moon’. March 1982 found the band back in the studio once more. 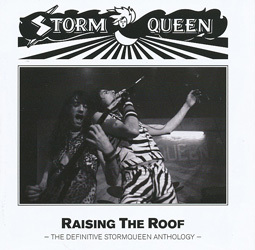 Like the NWOBHM around them at this time Stormqueen were shot full of confidence, and the ensuing three-track session, the first to be recorded with new singer Paul Burnett, included ‘Come Silent the World’ and another version of the rabble-rousing ‘Raising the Roof’ which were coupled as the band’s only single (faithfully reproduced as such on the vinyl version of this album). Good as it was to actually have a real record to tout around, the band were soon to realise that being based so far from London was working against them, but with confidence still running high they were back in the studio again within a twelve-month for another three-song session. The songs were now more involved, more complicated, as the musicians’ horizons were constantly expanding. In ‘Just For A Day’ they delivered a lengthy, plaintive ballad, and ‘The Fire And The Rose’ is the sort of song Ten would deliver fifteen years later. Frictions within the band and the inevitable frustrations at a lack of success left Stormqueen battered and bruised, and they almost vanished at that point, but a new-look band featuring bassist Nick McCormack and guitarist Andy Carney alongside Burnett, Morse and Boofy recorded one final session in October 1983. The songs (‘Tears For A Dream’ and ‘An Ocean And Beyond’) – as with a number of other NWOBHM acts at this time – now embraced the more commercial overtones associated with US melodic metal and showed the band (again, like so many of their contemporaries) growing apart from their NWOBHM roots. Unfortunately though, no matter how good the songs were, the writing was on the wall and Stormqueen folded soon afterwards. The album plays out with a 2006 re-imagining of their self-titled anthem, and caps off an illustrious and exciting compilation of material from a band that had the songs and the talent but missed out when it came to luck. However, on the strength of their one-off appearance at Brofest this year Stormqueen might, just might, be thinking of giving it one last go and raising the roof one final time. Now that’s a thought to savour!